Dammam Shipyard and Jeddah Ship Repair, part of the Al Blagha Group, one of the leading port and shipyard operators in the Middle East, continues to grow and win new projects in Saudi Arabia. Although liquidity due to the lower oil and gas prices has had an effect on the market and many rig or vessel repairs have pushed back projects to 2017, Dammam Shipyard continues to grow and expand, diversifying into the offshore and land rig markets, while preparing for a busy 2017, says Jason French, CEO Dammam Shipyard-Al Blagha. "Business levels have been affected in the domestic market, yet we expect to see a strong fourth quarter this year and very strong first and second quarters in 2017," he says. The outlook for next year is very positive even though there had been delays in asset repair and maintenance projects in 2016. Cutting preventive maintenance programmes is a short-term approach, says French. Failure to continue with a preventive maintenance programme will only allow companies a short-term gain and eventually it will affect their asset leading to significant a loss of revenue, he explains. As the company continues to expand in the Eastern and Western Provinces, providing mobile engineering teams for the offshore and major industrial companies onshore, it has also won several major industrial projects in 2016. Some of its key clients are major EPCI companies, jack-up operators and land rig drilling contractors. The company provides vessel and rig owners a fully equipped shipyard and berth access with a specialised in-house team of Engineers in the Eastern and Western Provinces. Dammam Shipyard has 600 m of quay and two floating docks up to 215 m, with fully equipped/certified workshops. Since February 2015 Dammam Shipyard has completed 12 fabrication and jack-up rig repair projects, he says. Al Blagha was founded in 1990 and has now over 10 marine infrastructure and project office sites. Al Blagha assumed control of Dammam Shipyard three and a half years ago and has grown the yard considerably investing in new equipment and shipyard facilities.Despite all companies within the marine, oil and gas industry being affected by lower oil prices, Dammam Shipyard has remained in demand thanks to its competitive edge as the closest shipyard to Saudi Aramco’s oilfields. Such close proximity means vessels and rig owners can remain in Saudi waters, thus saving time and money, as there is no requirement to cancel work permits or for vessels to go through custom clearance. Furthermore, the company’s fully certified personnel, and its implementation of ISO and API quality management systems ensures continuous improvement and safe working practices. 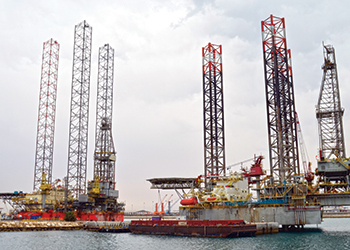 By using Dammam Shipyard, jack up operators, land rig drilling contractors, and EPCI operators working in Saudi now have the option to remain in the kingdom.